A waiting room screen can improve the image of your business. A good screen waiting is the key that will ensure a good agreement with your customers. Combined with the Linutop operating system, it will no longer remain just like a simple screen, but as a powerful communication tool. What are the benefits of a good waiting room screen? First of all, a good waiting room screen is a modern and professional way to give a warm welcome to visitors or guests who enter your building. It also becomes interfering when you use it as a communication tool to project various types of information ranging from simple texts to HD corporate videos. With good accessories ( see Linutop OS ), it can also stream movies, flash animations and web pages. This dynamic display can also be used to play audio files. A corporate home screen will ensure quick and easy dissemination of information to your customers or employees. Your screens waiting room with the help of mini-PC Linutop allow you to communicate faster. The system can operate 24/7 and is specially designed to be a low power system. Their configuration is very simple and these mini PC fanless operate quietly. Linutop mini PCs are the perfect accessories for waiting room screens. Due to their small size, they can be installed wherever you want in shops, restaurants, hotels, museums or public transport, whatever. As a digital display medium, they have several features. It is possible, for example, to set the duration of each folder: photos, videos, Web pages ... With Linutop, a multitude of parameters are available. Linutop mini computers have other advantages. Since they are fanless, they consume very few energy. Indeed, Linutop micro-computers have an energy requirement 10 times lower than ordinary PCs. The Linutop dynamic display solution is an ideal choice for professionals who intend to broadcast every day. They can turn into Internet kiosks within a few clicks thanks to the Linutop Kiosk software. 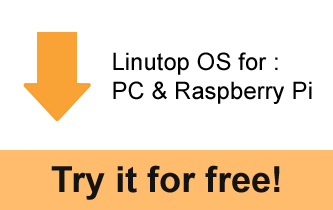 NEWS : Linutop OS XS for Raspberry Pi! Try it on Raspberry Pi!